This course is specifically for those people who work during the day. 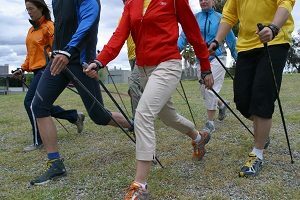 The objective of this course is to quickly get you competent with the NORDIC POLE WALKING Technique so that you will reap all the benefits quickly, and make this exercise truly enjoyable and EFFECTIVE for the rest of your life. 10 SESSIONS for $97. Bonus: you have some flexibility in which Monday eves you attend! EFFECTIVE TRAINING & SUPERIOR COACHING. The first part of the class will focus on muscle strengthening and Nordic technique. The group will alternate between a 5 station (rubber band) exercise circuit, and pole walking with a total focus on technique. The second part of the class will be a 30-minute pole walk where the focus is on fun and camaraderie. ACCOUNTABILITY: Track your at-home “training” with your COACHING CHART. Check your chart progress with Coach Linda each Monday. to effectively teach you how to Nordic Pole Walk so that you create MAXIMUM BENEFIT from your exercise. $10 for rubber exercise band (thera-band) if you do not own one. YOU MUST PRE-REGISTER FOR THIS COURSE.